People have devised many sayings to reiterate that nothing comes for free and good things are not easy to attain. Classic London however, can be done without spending too heavily. Take a look at some of these iconic sites and realise that you don’t need to drop a shed load of Queen Lizzie’s to get a good slice of “class” in the British capital. Everyone wants to keep in touch when travelling abroad. London’s phone booths are not only stylish, classic and an icon of the city, they’re cheap and functional too. Especially useful to use if you don’t want to buy a new sim card in every different country you travel to – they also look cool with you hanging out of them in many photo opportunities too! London is a city that offers some of the most iconic bus services in terms of efficiency, safety and cheap sight-seeing. 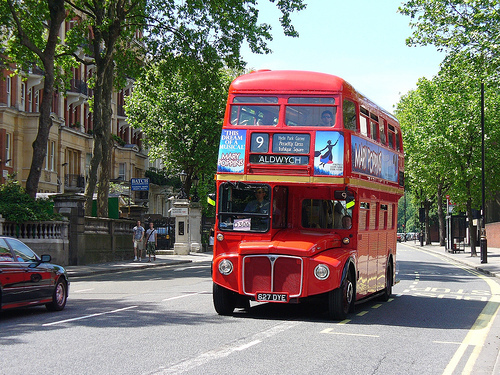 �A Double Decker bus gives you that tourist feel of being able to sweep around the city with some sharp views from above, ensuring that your eyes ‘feed’ on some of the best scenes that London has to offer. London’s buses are also well maintained, safe to ride on and have some really cool and informative tour guides too. Route number 11 is one of the most famed bus routes, taking in sights like St Pauls, London Bridge and the Olympic Village. Walking is just one of many cool�tricks to avoid overspending in any city, and it works in London, too. Visit the greatest historic reminder of the British Napoleon War victory over France in 1805, Trafalgar Square. Re-designed in 1820, the present day Trafalgar Square architecture reflects the changing face of the city and provides a great lead-up to another cheap and classic London sight, the National Portrait Gallery. This wonderful historic site is located in the heart of London; next to Westminster City, with Nelson Column at its centre and the roaring lions at each corner. Nearby you can also walk around St. James Park up to Buckingham Palace and see if the Queen herself is in for tea. Other classic London walks involve routes down the Thames up to Pimlico and the Tate Britain Museum, as well as walks down Regents Canal starting in Camden and ending in London’s shabby chic mecca, Broadway Market. If you’re looking for accommodations for both small and large groups of people visiting London make sure you check out�Oh-London.com�too. Their wide range of apartment options complement any classic London drop-in.